You might consider blepharoplasty if droopy or sagging eyelids keep your eyes from opening completely or pull down your lower eyelids. Removing excess tissue from your upper eyelids can improve your vision. Upper and lower lid blepharoplasty can make your eyes appear younger and more alert. During blepharoplasty, Mr Kheterpal cuts along the creases of your eyelids to trim sagging skin and muscle and remove excess fat. After the excess tissue is removed, he joins the skin with tiny stitches. Blepharoplasty a type of surgery that repairs droopy eyelids and may involve removing excess skin, muscle and fat. As you age, your eyelids stretch, and the muscles supporting them weaken. As a result, excess fat may gather above and below your eyelids, causing sagging eyebrows, droopy upper lids and bags under your eyes. To help decide if blepharoplasty is right for you, find out what you can realistically expect and explore the benefits and risks of blepharoplasty. Ask about how surgical risks apply to you. Understanding what’s involved in blepharoplasty and weighing the benefits and risks can help you decide if this procedure is a good option. Your medical history. Mr. Kheterpal will ask questions about previous surgeries and past or current conditions, such as dry eyes, glaucoma, allergies, circulatory problems, thyroid problems and diabetes. He will also ask about your use of medications, vitamins, supplements, alcohol, tobacco and drugs. Your expectations. An honest discussion of your hopes and motivation for surgery will help set the stage for a satisfactory outcome. Mr. Kheterpal will discuss with you whether the procedure is likely to work well for you. Blepharoplasty is usually done as a day case. Your surgeon injects numbing medication into your eyelids and administers intravenous medication to help you relax. The procedure is usually done under a local anaesthetic often with a sedative to make you relaxed. If you have surgery on your upper and lower eyelids, Mr. Kheterpal generally works on your upper lids first. 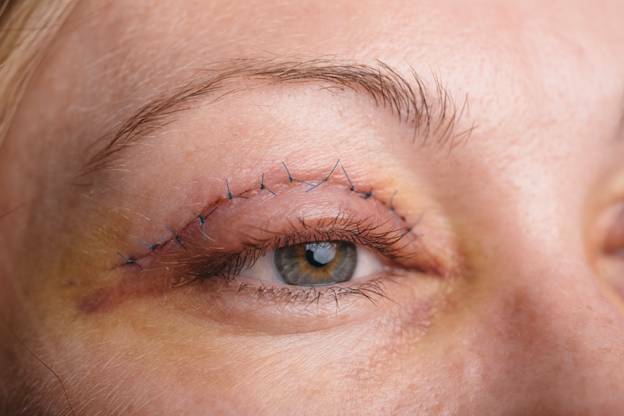 He or she cuts along the fold of the eyelid, removes some excess skin, muscle and possibly fat, and closes the cut. On the lower lid, he makes a cut just below the lashes in your eye’s natural crease or inside the lower lid. He or she removes or redistributes excess fat, muscle and sagging skin, and closes the cut. If your upper eyelid droops close to your pupil, Mr. Kheterpal may do blepharoplasty with a procedure called ptosis that provides additional support to the eyebrow muscle. After surgery you spend time in a recovery room, where you are monitored for complications. You can leave later that day to recuperate at home. Gently clean your eyelids and use prescribed eyedrops or ointments. Apply cool compresses to reduce swelling. After a few days, return to have stitches removed, if needed. For about a week, avoid aspirin, ibuprofen, naproxen sodium and other medications or herbal supplements that may increase bleeding. If needed, use paracetamol to control pain. Many people express satisfaction with the results of blepharoplasty, such as a more rested and youthful appearance and more self-confidence. Most people are very happy and careful pre operative preparation and understanding of the risks and limitations of the surgery can reduce the chances of misunderstanding afterwards. For some people, results of surgery may last a lifetime. For others, droopy eyelids may recur. Bruising and swelling generally subside in 14- 28 days, which may be when you feel comfortable going out in public again. Scars from the surgical cuts may take months to fade. Take care to protect your delicate eyelid skin from too much sun exposure.Overall healing may take 3 to 12 months so some patience is required.